For the first time in about nine years (!) I have finally scanned some new press cuttings and can present to you, my loyal readers, previously unpublished material! I would say ‘can present to you with pleasure‘ except there is very little pleasure to be had from the memories invoked by this new batch of newsprint. First cab off the rank just happens to represent season 1997-98 which, until Terry Butcher got his hands on the reins in 2013, was just about the worst season in Hibs’ history. Although we had been relegated twice before, the absolute horror show of Hibs’ fall from the top of the table in September to the very bottom before New Year was mesmerisingly awful. Truly Hibs were like a rabbit caught in the headlights, going 15 games without a win and clocking up a seven game losing streak. Jim Duffy is the main villain of this piece, ably supported by the Hibs board who first appointed him and then let him linger for so long that Alex McLeish’s rescue mission was made virtually impossible. Poor old Billy McNeill was dragged out of semi-retirement to try and help Duffy turn it round but he was gone within a month as the team continued to gaze hypnotised at the oncoming truck. Nevertheless, there are a couple of highlights here: Chic Charnley’s moment of glory, lashing a 20-yard winner past his bhoyhood heroes Celtic on the season’s opening day; and the defeat of Hearts in April, effectively ending their title challenge. Even if it did us no good in the end it made us feel better for a few days. Small consolation in a season that made us feel rank rotten for many months. Categories: hibLOG season by season | Tags: 1997-98, Alex McLeish, Jim Duffy, relegation, Tom Farmer | Permalink. Categories: Press cuttings | Tags: Alex McLeish, board, chairman, Jim Duffy, Pat McGinlay, relegation, Tom Farmer, Tom O'Malley | Permalink. Categories: Press cuttings | Tags: Dundee United, Easter Road, Grant Brebner, Kjell Olofsson, relegation | Permalink. At this point in the season, with five games remaining, Hearts were still in the title race, and with Celtic beating Rangers on this day a victory at Easter Road would have kept Hearts within a point of both. Hibs were as good as dead, surely their resistance would be futile? 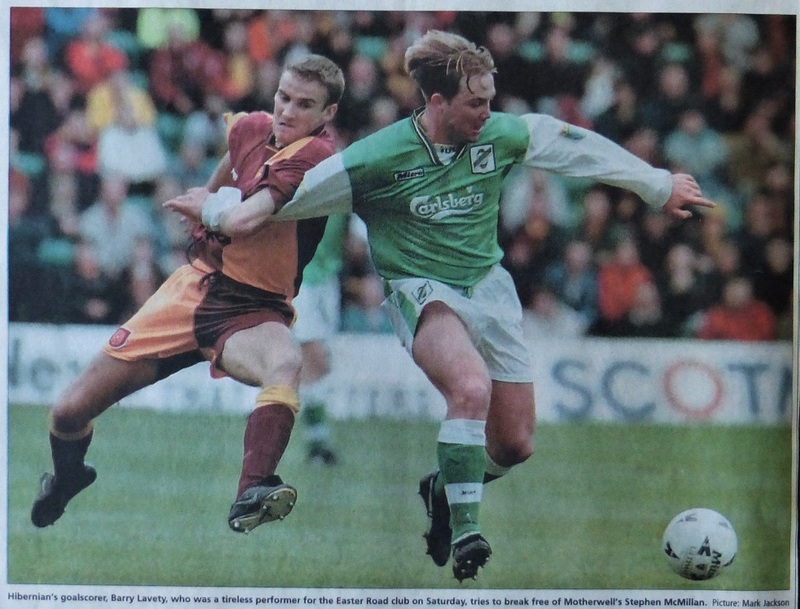 Categories: Press cuttings | Tags: Barry Lavety, Easter Road, hearts, Kevin Harper | Permalink. Categories: Press cuttings | Tags: Alex McLeish, Gordon Durie, Rangers | Permalink. Categories: Press cuttings | Tags: Alex McLeish, Barry Lavety, Bob Crampsie, Motherwell | Permalink. Tommy Burns, done deal, stick on. Except it wasn’t. Burns never arrived. 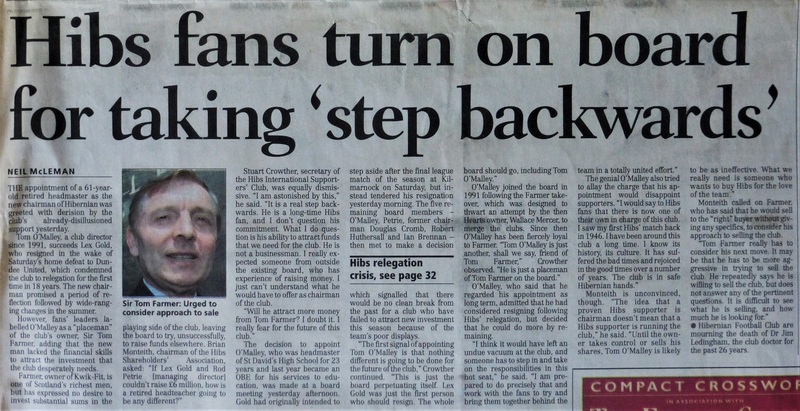 Instead it was Alex McLeish who walked through the door to try and save Hibs from the drop in the remaining 12 games. McLeish left Motherwell who were sitting just five points above Hibs in ninth place. The previous season Motherwell only avoided the play-off place on goal difference from Hibs. The season before that they finished eighth as well. 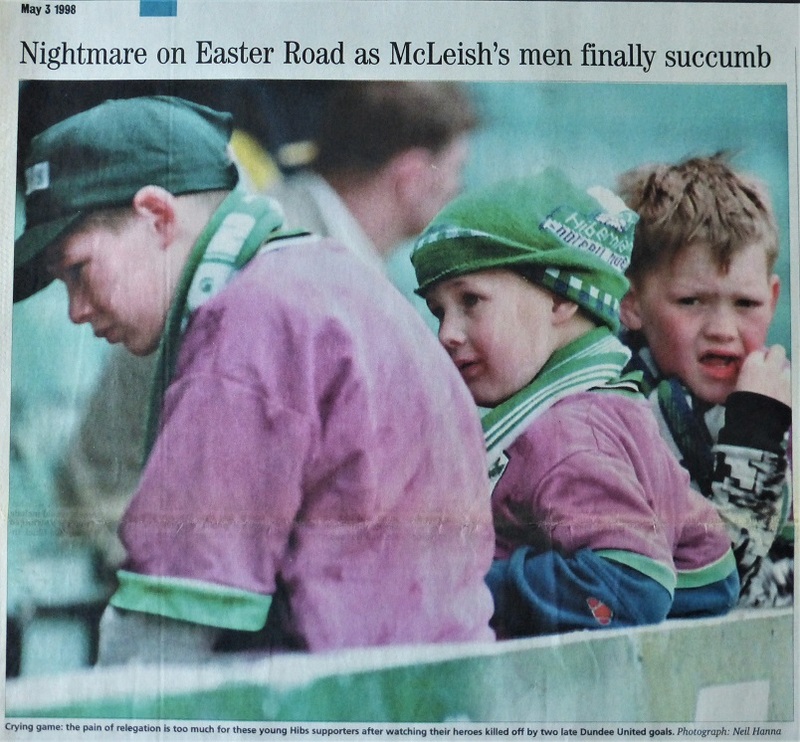 Apart from being the manager of the team whose 6-2 gubbing of Hibs proved the final straw for Jim Duffy, McLeish’s main claim to managerial fame was his second place finish in 1995. Perhaps his recent success in winning relegation battles with Motherwell was the clincher. What of the future though, we wondered. Categories: Press cuttings | Tags: Alex McLeish, Chic Charnley, manager | Permalink.